I have ridden a few 10km, 20km, 30km climbs before and they can be tough, especially when the gradient gets above 7% (and you haven’t been listening to Bjarne). But, if you can get off the bike at the top, the fatigue goes away very quickly. You can have a stretch, drink some water, eat some food and talk to your mates. Long descents can be a lot of fun, if they are not too twisty and if you are not trying to go too fast. However, if you are trying to go fast, by which I mean 80, 90 or 100km/hour, there is no leisure to the descent. It is like wrestling a bear for 30 minutes. 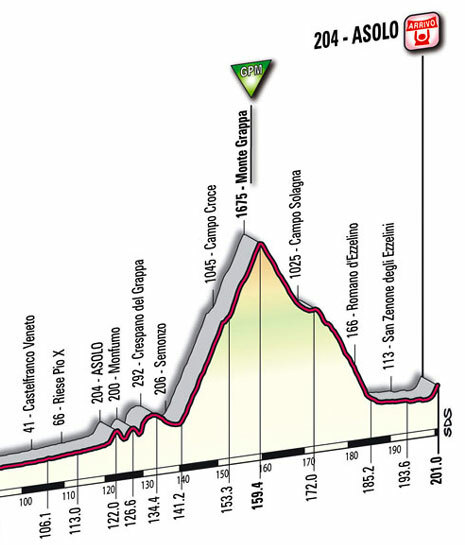 If you were racing the Giro d’Italia today, you would have experienced fatigue that is impossible to describe. A 20km climb with an average gradient of about 9% then, without a moment’s respite, a twisty as hell 25km descent. Vincenzo Nibali summited the Monte Grappa in a group of four. He gapped the other three, including our mate Cadel (no slouch when it comes to descending) and won the stage by 23 seconds. Confucius say, Nibali is a tough unit. Previous Previous post: America + Football = Progress? Next Next post: Cycling, not so dopey?